EDTA (Ethylenediaminetetraacetic acid) is a common chelating agent in biochemistry. EDTA should be avoided in protein purification with a metal affinity column such as a Ni-column. Free EDTA should not be included in many enzyme reactions where divalent cations such magnesium, calcium and zinc are required for the enzyme activity. 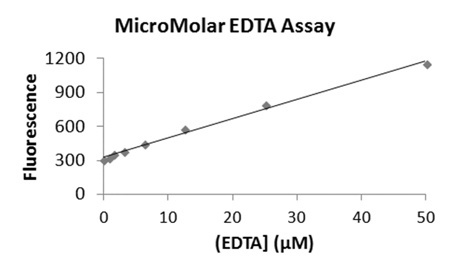 The MicroMolar EDTA Assay Kit (Catalog number EDTA200) is designed for measurement of micromolar concentrations of EDTA. The assay is based on increase of fluorescence at 535 nm of the dye C56 in the presence of EDTA. The assay kit can be used for measurements EDTA concentrations in biological samples, biochemical reactions and environmental water samples. The assay is compatible with HEPES buffer, low concentrations of non-ionic detergent (<0.01%), Tris-HCl (<10 mM), and phosphate (< 1 mM). It is not compatible with thiol compounds such as DTT, 2-mercaptoethanol or cysteine. The MicroMolar EDTA Assay Kit (catalog number EDTA200) provides the reagent for measurement of 200 samples using 96-well plates. Cuvettes may also be used for measurements.